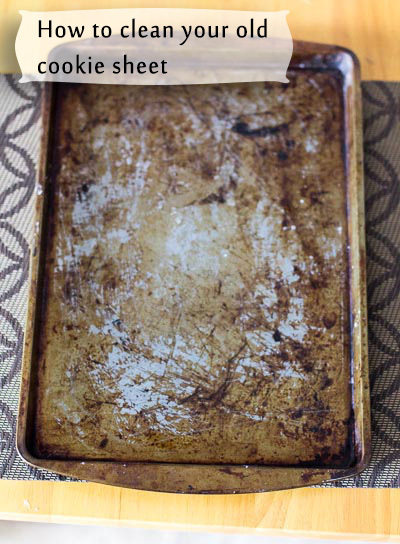 The photograph above shows how rusty was my old cookie sheet. 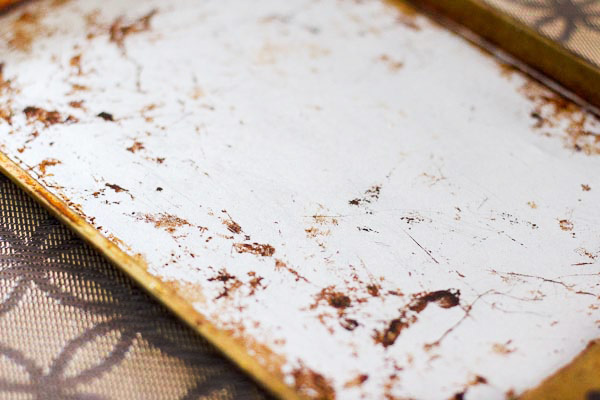 After years of use, all the grease that is used to avoid the cookies to stick to the tin gets build up, gets burn and stuck, and even promotes some rust. I just started to add a sheet of aluminum foil, so the cookies won’t touch the build up, but after a while I was ready to just trow it away and get a new one. But I decided to give it one last chance and try some deep cleaning. 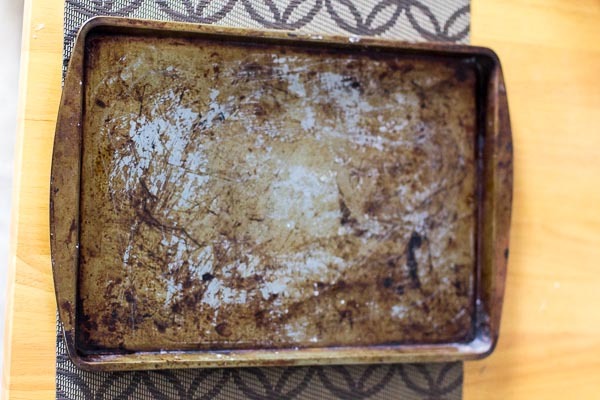 So, what you need to clean your old cookie tin? 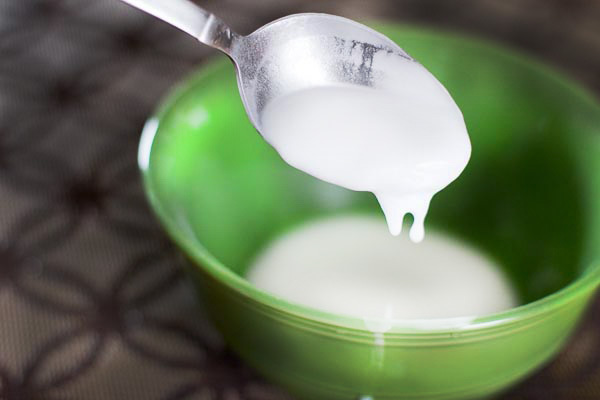 Start with 1/4 cup of baking soda, and add it to a bowl or any container were you can mix it and create a paste. Then add 3 tablespoons of hydrogen peroxide, and mix to create a paste. Although you need a paste, it has to be close to liquid, to make it easier to spread on the cookie sheet. 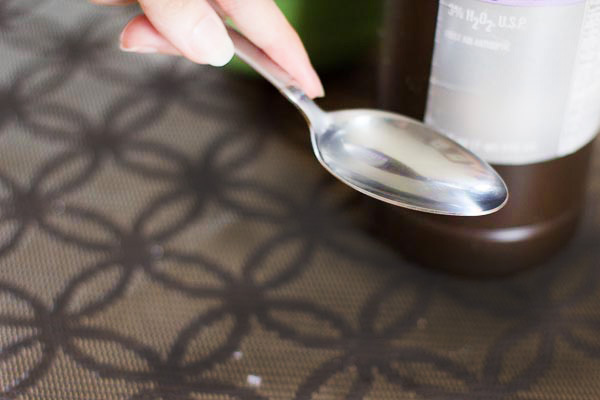 With the help of a spoon, spread the paste on the cookie sheet until you cover it completely. And, learn from my mistakes, and also cover the borders.. not just inside the cookie sheet. Let it rest for at least 20 minutes. 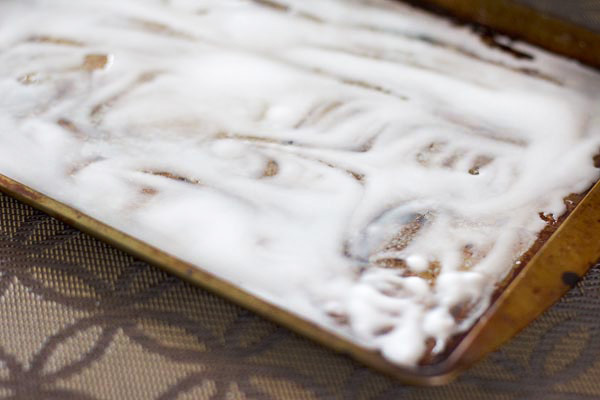 With a small amount of aluminum foil, create a ball, and use it to scrub the cookie sheet. The aluminum foil ball will be more effective than a sponge in removing hard grease. And that is my result after applying the paste, let it rest and scrub and scrub for at least 20 minutes. You can see that is not completely clean, but it did remove almost all of it. I did it a second time but did not see much difference after the second time. So I intend to give it some time and repeat the process after a couple of days. You can see the difference side by side. Not completely clean, but definitely better than before cleaning. Follow me on Pinterest. Follow me on Facebook.